The Green Horticultural Group are pleased to present new innovations in turfscaping, including the Blecavator - a cultivator that carries out six operations in one pass to become the solution to a wide range of ground preparation challenges. The ideal machine for preparing both small and large areas quickly and economically, the Blecavator cultivator runs on a very simple concept. A heavy duty contra-rotating rotor, equipped with special bolt on blades, digs into the ground up to 230mm deep, lifting and throwing the soil, rocks and debris against a sorting screen mounted behind the rotor. The screen separates the rocks and debris, directing them into the bottom of the trench. The fine soil which passes through the screen is then deposited over the top and levelled off. To complete the process, a rear packer roll firms up the finished areas. ability to sow seed utilising optional hopper. 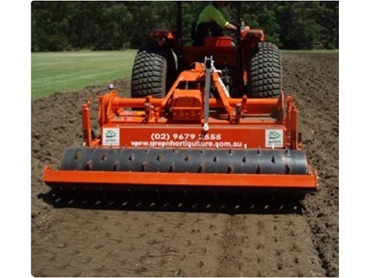 Blecavator cultivators are used extensively on golf course sites, turf farms, sports fields, landscaped areas, private gardens and estates, municipal amenity sites and many other applications where quality and reliability is essential.